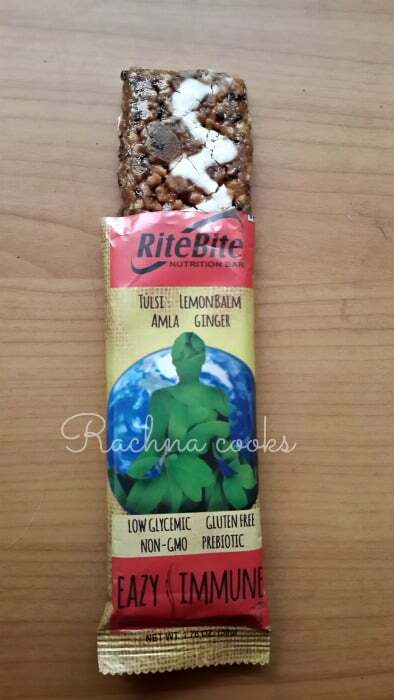 I have already done the review for Max Protein Bars by RiteBite earlier. So when I was approached to review the newly launched bars from their stable, I was up for it. These are herbal bars that are positioned in the health bars, meal supplement niche. They are made from natural ingredients and herbs as claimed on the pack and help with weight management, stress management and building immunity. These are the three bars that have been launched: Eazy Slim, Eazy Calm and Eazy Immune. This bar proclaims to have the goodness of Green Tea, Guggul, Yerba Mate and Garcinia.These ingredients help in weight management and free radical reduction in the body. Each bar has 14 g protein, 11 g Carbohydrates and 8 g Fiber as per pack information. They are supposed to provide all vital ingredients and help with weight management. The bar has no added sugar, is of low glycemic index, prebiotic, gluten free and non-GMO as per pack information. Taste wise this bar is quite nice to taste. It has a top layer of sugarfree dark chocolate and has oats and cranberries inside. This bar proclaims to have Ashwagandha, Passion Flower and Tulsi. This is another bar meant for both weight management and as a dietary supplement. It has 14 g protein and 8 g fiber. It contains no added sugar, is of low glycemic index, prebiotic, gluten free and Non-GMO as per pack information. Passion flower is supposed to help with stress. Tulsi and Ashwagandha have healing properties. Taste wise, the bar has a nice chocolate taste. It has sugar free dark chocolate and oats. This bar has Tulsi, Lemon Balm, Amla and Ginger for building immunity. The bar has 12 g protein and 8 g fiber. It has a low glycemic index, is non-GMO, gluten free and prebiotic. Each bar has 14 g protein and 8 g fiber and is recommended for weight management and for building better immunity. The bar has an interesting taste of lemon, ginger and honey. I quite enjoyed the taste except that it felt too sweet. It has a nice crunch of black sesame seeds and flax seeds and the sweetness is from honey and dates. Each bar is priced at Rs. 90 for 50 gm. bar which is quite pricey. You can keep it as a meal supplement in your purse for those times when you just have no access to healthy food. Since, I have not used the bars for any weight management plans, I cannot comment on those properties of the bar. As a meal supplement, these bars are pleasant tasting. 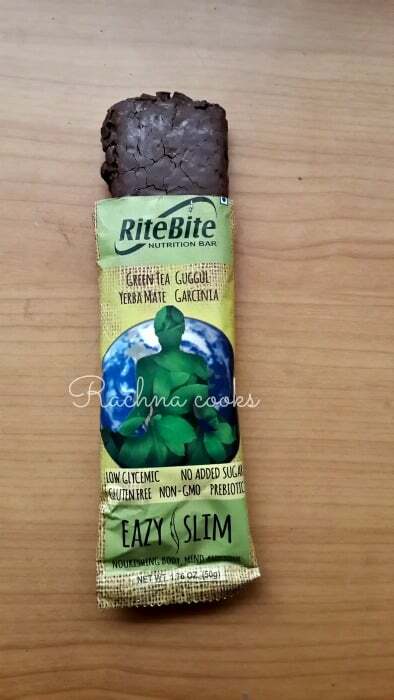 Get RiteBite’s vast range of Nutrition Bars in your favorite supermarkets, online portals as well as on the website of Naturell India. Do consult your doctor before consuming this or any other health bars. If you have any health conditions or are pregnant or nursing, consume these bars only after consulting with your doctor. Disclosure: I was sent free samples of the bars for review. All thoughts are honest. I love granola bars and anything that has Ayurvedic ingredients sounds interesting! Yes, they do seem pricey though 🙂 Nice detailed review, Rach. Not only bars, Ravish. 🙂 Healthy diet and exercise are a given. 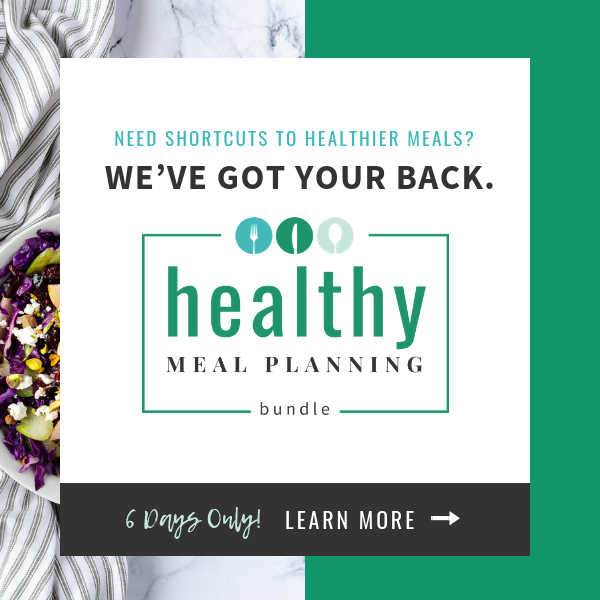 These can chip in for those times when one reaches out for greasy, unhealthy stuff out of hunger. 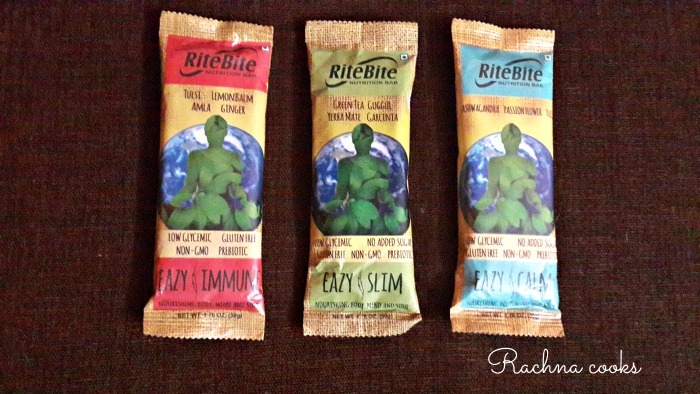 I’ve been munching on Ritebite bars since my first School Sports Day.. and I still love them! Haven’t heard of these new flavours though.. Will surely harass the nearby mall owners to store them for health-conscious people like me! That’s something which catches my attention! Getting slim and protein bars which are herbal! 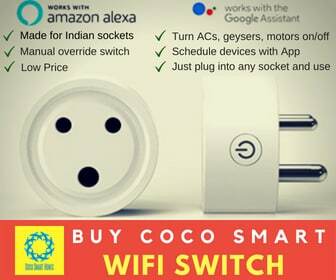 🙂 Great review, Rachna! I am a great fan of health bars Rachna. Like to keep in my purse while travelling. I love granola bars but haven’t found anything tasty here so far…Will try this! There are some really nice tasting granola bars now available in India, Naba. Hehe Pretty nice tasting bars they are. Good review Rachna. I like these health bars but yes, they seem to be expensive. Could be cos of the ayurvedic contents. Haven’t tried them yet. Any flavour at all. These sound good. I wonder if they’ll really do what they claim.